- Take Backup of Webmail, Cloud Mail, cPanel & Web Based Email Client Emails. - Complete Backup of IMAP Account Messages from Online Email Services. - Allows to Migrate Email Backup to Email Formats or Cloud Based Email Services. - Email Backup Utility Facilitates 100% Safe & Secure Backup of Emails. - Advance Filter Option to Sort and Create Backup of Emails. 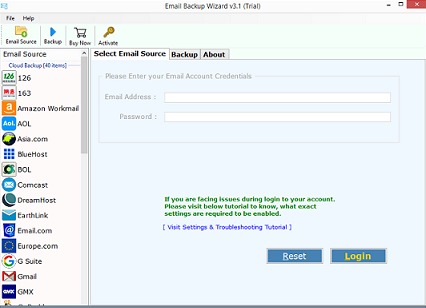 - Simple GUI of Backup Wizard Provides Hassle Free Platform to Archive All Mails.